Most teams bounce around a lot over a 10-year span. You see some playoff appearances, some bottoming-outs, and everything in between. But on one side, there are the Patriots, winning every year. And on the other, there are the Browns, whose biggest highlight over the last 10 years is almost getting to a .500 record in 2018. The team hasn’t finished higher than third since 2007, with nine fourth-place finishes in the 11 seasons since. But there’s hope! The 2018 Browns were decidedly decent, and now head into 2019 with a foundation, a new head coach, and massive cap space. Check back on this sort of piece in six or seven years. Things could be interesting. Let’s take a look at the best Browns fantasy seasons of the last decade. 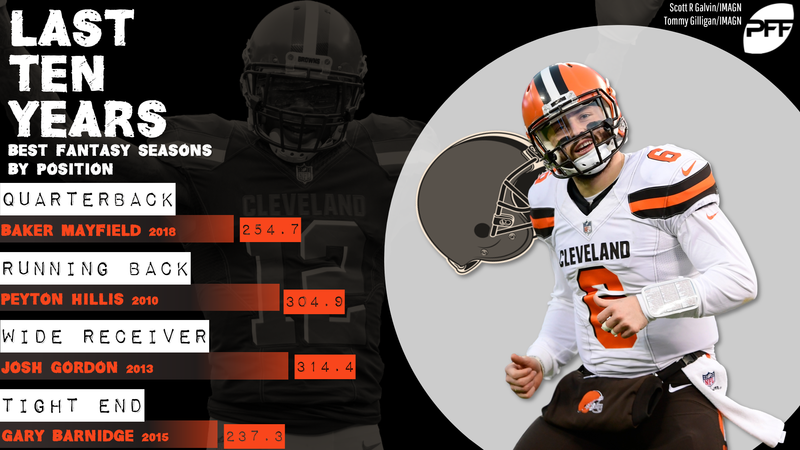 Mayfield was the best Browns fantasy quarterback over the last decade (best real one, too). It was the worst “best” season for any team in that timespan. And yet, Mayfield not only led the team position in scoring, he did so by nearly 50 points. We all know the Browns’ quarterback situation has been comical for a long time, but it’s hard to illustrate that any better. Mayfield, entering his second season in 2019, looks like the answer to the Browns’ run of futility, and he is the biggest driver of optimism for the future. Jarvis Landry had a pretty successful first year in Cleveland. He topped 1,000 yards from scrimmage, scored a few touchdowns, established himself as a good receiver and not just a product of Miami. He put up the second-best Cleveland receiver season in our sample. He also finished almost 100 full PPR points shy of Gordon’s 2013. It looks pretty clear that Gordon will never quite recapture that glory, if he even plays again, but for those who employed him in fantasy in 2013, those are some fond memories. This will always be one of the most random seasons. Barnidge was entering his eighth season in 2015 and had 603 yards and three touchdowns total in the seven preceding years. He was 30 years old, a fifth-round pick who had never done much of anything. And then he was suddenly a fantasy monster, getting the nickname “Barnkowski,” intriguing everybody. And then almost as suddenly, he was gone. He finished as TE19 in 2016, then was unceremoniously dumped when the team drafted David Njoku in 2017 and never got another contract.